When I went to NT, like most, I was in a mild state of shock at the number of so many good musicians there. I proceeded to sign up for auditions for Jazz Improv classes. Well, I went to my tryout time for the audition for the Improv classes, and the TA's that were supposed to audition me did not show up. I tracked them down. They said, "No worry, we will just place you in a class." So, he next day, I went to see where I had been placed. It was in the lowest class. So, with my tail dragging between my legs, I made myself go to the first class. To my surprise, it was being taught by Rich. Along with his other classes, he always taught the lowest class. I could already play fairly well and Rich liked my playing, and being thrilled to have him as my teacher, I worked hard for him. The next semester he gave me a class to teach! Also, when he went out of town for solo performances or workshops, he would often turn over his graduate improv classes to me. At the end of the second semester I was there, he told me to give him a call the first week in June. I did, and he hired me to go play and teach at a workshop out in Iowa with him, Jack Petersen, Jim Riggs, Pat Coil, and Willie Thomas, and others, and also did the same again for the next summer. Needless to say, I was pretty much shaking in my boots to be on stage with him and those other fine players, but it was a thrill and a wonderful experience. I will always appreciate his kind-hearted soul, his mentorship, and that he took me under his wing while I was at NT, and gave me the chance to do some teaching and playing with him. And of course, I learned a ton from his teaching and listening to him play! It was a lucky twist of Fate that I ended up in that last Improv class that was taught by Rich Matteson! I had just finished my last highschool jazz band concert in '89 with then guest artist, saxophonist Chris Vadala. The next day, Chris informed me he placed a call to Rich to audition at this then unknown jazz music program at U. North Florida just getting off the ground. I can say that that first year playing alto in Rich's 1:30 big band was life changing. Rich taught me more about jazz and swinging than anyone else. When Rich was ill during his final months, he selected a small handful of music students to help Mikki out in tending to him. I'll never forget my last visit to the house and the last time I spoke to him. Rich asked me if I wanted to hear his most recent album. Of course, I said sure! After playing it, Rich asked if I wanted a copy. I said of course! Then Rich curled his index finger waving me to his bed side. He then leaned into my ear and quietly whispered "That'll be $10, cash or credit card?" I'll never forget how hard we both laughed. So much love from one of the greatest jazz educators and human beings I've had the privilege of knowing. Yeah babe! "Dump the truck!" Most people who have heard about the jazz program at the University of North Texas know it is one of the best and largest programs in the world. It is also very competitive which makes it easy to get lost in the crowd in such a place. Rich Matteson was like a lighthouse beacon searching for lost souls such as myself and would give them a word of encouragement and then a kick in the pants in the direction of the practice rooms. I was at the point of giving up when that happened to me. It was because of his coming along side, as well as my own father’s words of encouragement that I stuck it out and ended up turning things around to finish well rather than failing. On my latest CD project I wrote "Rich Living" is a tribute to this man whose impact on me as a player and as a teacher continues to this day. I met Rich in 1985 when I was a student at the Navy School of Music in Little Creek, Va. At the time I wasn't familiar with him or his playing. I was asked to accompany him at a school clinic on improvisation and I thought that would be great as I was always anxious to improve my own skills and happy for a chance to play with who I was told were great musicians. Little did I know how great. My own status was a little iffy because at that time I couldn't sight read worth a damn and the proposition of either going to a band to play my instrument or swabbing decks on a ship was not a pleasant one. After listening to Rich's clinic and playing with him everything changed for me. I'll always remember Horace Silver's "Gregory is Here" and "Stella by Starlight" as the two tunes that got me out of that school and gave me my career as a Navy Musician. Thanks to Rich's opening chorus to "Stella" he inspired me to play my a-- off. He was swingin' like nobody I had ever played with and took me and the rest of the band to places where all we could do was smile and go "Yeah!" He MADE you play! No foolin' around with this cat! One of my instructors came to me afterward and said "Don't worry kid, we have to go through the formalities, but you just graduated. I am now retired from the Navy Music Program, teach piano and jazz piano at Olympic Community College in Bremerton, Washington. I use Rich's ideas and teaching technics as I remember them all the time. I am thankful to have had such a wonderful, life changing encounter with one of the most incredible musicians I ever played with, a genuine gentleman, and an educator in the finest sense. Thanks, Rich Matteson! With a one time encounter, you changed a life as I assume you changed many. In 1976-77 during my tenure at NTSU I was extremely fortunate to be in the 3 O'Clock Lab Band, which Rich conducted. While there was lots of experimentation going on back then within the arrangements and time signatures, Rich pretty much stuck to charts that swung. While other conductors may have stopped a rehearsal because of a sour note or not playing a particular rhythm correctly- Rich was the only person I have ever known who would stop the rehearsal because the groove wasn't right. For him, it just had to groove. On the days the band was really swingin', he couldn't stand it and would get his axe and blow with us. If he didn't have his axe that day he'd grab a valve trombone. He just had to play! He was a true musician's musician. I first encountered Rich as a student at North Texas State, and I am still amazed at his virtuosity. A great musician, a great teacher, and a great human being. He gave me my start in publishing by enlisting me in the "Famous" Outrageous Mother Publishing Co. and continues to inspire me to this day. A musical mentor, but best of all, a good friend! Thanks, Rich. Rich Matteson was admired by everyone who knew him. His incredible performances are demonstrative music lessons in new potentials for every brass instrumentalist. As a jazz musician, Rich established standards of technique, range and creativity beyond the conception of most players. He continues to advance the cause of brass players, especially for those who play euphonium and tuba. I will forever treasure the close friendship and professional association Rich and I enjoyed over many years. I looked forward to every contact with Rich; there were always new projects to discuss and new joke to end every conversation. Rich Matteson is a musical inspiration. We all know musicians who are “Jacks of All Trades, Masters of None” – Rich Matteson, however, falls into a different category. Over the years performing with Rich in the Matteson-Phillips TubaJazz Consort, I saw him do it all; and he did it all well! He wrote excellent charts, he played all of the lead, he played the best jazz, he dealt effectively with club owners, and he handled hecklers, and inpired the band to play well together! Add to this the fact that he was also an outstanding teacher, family man, and community citizen and you have it: “Jack and Master of All Trades”! Rich was the type of person we all need (and want) as a friend – a rare focus of talent, energy, and concern (love) for those around him. I had the good fortune of work with Rich in Vegas. I consider Rich to be one of the best music theoreticians in the world. His abilities span the entire spectrum of serious music from classical to jazz. I have nothing but respect and admiration for this human being. This man was not only a dear friend to me, but to everybody. He, like Clarke Terry, was a great teacher and humanitarian. Rich was a giant of a musician and had great communication with kids. He is one of the most underrated players in the world. Once people hear him, they know he is in the same league as Clarke Terry, Oscar Petersen, and Benny Carter. I always looked forward to playing with Rich because he made me play! (With a lot of love, too.) Not only did I learn a lot from him musically, but I learned a lot as a human too. I’m happy to call him my friend. Rich Matteson was a wonderfully convincing man. I’ve had numerous opportunities to leave Chicago, but I never seriously considered leaving until Rich called me and convinced me to become part of his jazz team. His enthusiasm was so strong that I remember living the vision as he spoke. That’s why I now live in Jacksonville instead of Chicago! It’s unusual to find so many diverse skills at the highest level in one man, player, teacher, and administrator. The one I must add myself, a True Friend. If I had the opportunity to do it all over again, I would! I met Rich around 1968 when I was 12 or 13. He was the first educator to get me excited about jazz. He taught me theory, and who to listen to. Above all he took me under his wing. Rich was interested in my growth and development as a musician and a person. To a kid, that means so much. Rich has a knack for making each person feel special. He’s still the most important musical figure in my live. I wouldn’t be where I am today without Rich! Rich was a fantastic musician, teacher, arranger, and person with nothing but love in his heart for God, music and human beings, especially students. He was comical, too! He kept me laughing all of the time, and I loved being in his company. He was pleasant, soothing, and educational. We met at the Clarke Terry Camp in Kansas, and we hit it off the very first day. I really dug him after I heard him play. Besides all of that, I love him. Rich was one of my closest friends for many years. We were in a mutual admiration Society. He was really a ball to play with. Several years ago when I had a group with Bob Brookmeyer, Rich came to the gig. He had never met Bob. Bob fell asleep on a couch after a few too many drinks, so Rich sat in on valve trombone. When Rich started playing, Bob sat up and started listening. At the end of the tune, he walked up to Rich, looked him up and down and said “Not bad for an old geezer!” Ever since then I called Rich “Geez”. We always looked forward to the opportunity to play together, because it was so much fun. Rich was great on and off the bandstand. He’s the type of person I liked being around. I love him! Rich and I were involved in jazz education since the late sixties. We had the opportunity to travel and perform together all over the world. Once, when we were in Sweden, we decided to drive from Stockholm to Copenhagen via ferryboat. The problem was we had a lot of luggage, even for a Volvo station wagon. Three Anvil cases for guitar, amp, and euphonium, plus four huge suitcases. My wife and I sat in back with one of the suitcases between us. All went well until we got to England. England has two large airports, and there is a helicopter service from one to the other. Of course we missed it and had to hire a driver and car to take our luggage and us. He showed up in a Volvo station wagon, took one look at us with our luggage, and said it couldn’t be done. Rich and I said “Just watch!” I wish I could describe the look on the driver’s face as we proceeded to load the car in about fifteen seconds. I still laugh about it. Rich Matteson was the closest friend I had. Rich Matteson was something else! I remember when we met. It was December 1968. William J. Bell, a former teacher, and I were having lunch when he spotted someone he had recently met via working on the early Meinl-Weston tubas and euphoniums. He said, “I want you to meet someone. He’s the hottest jazz euphonium/tuba player you will ever hear!” Of course, he was talking about Rich. 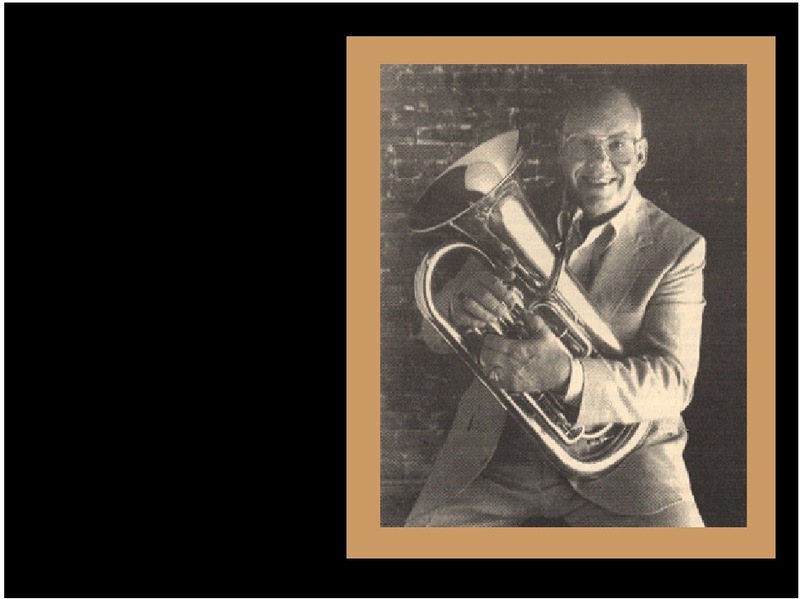 It wasn’t too many years after that when the phone rang and Harvey Phillips was telling me how we are going to start a jazz tuba group, how we were going to do our first gig in Montreaux, Switzerland, and how Rich Matteson was lead euphonium. I spent countless hours performing with and listening to Rich play the euphonium. What I heard is hour after hour of incredible, phenomenal playing that never fails to knock everybody out (including the rest of the guys in the band)! The secret behind the jazz phenom known as Rich Matteson is love. NOBODY loved what they are doing more than Rich. He was an absolute master and can hold his own with any bopper on any other instrument. When Rich performed, it was exciting. Rich has never played a boring note. He played from the heart. Just when you think you’ve heard everything, he takes it one step further. When you hear it, you’ll know it. And, inevitably, you will shake your head side to side as if to say “I didn’t really hear what I just heard him do, did I?” Aren’t we lucky Rich chose euphonium and tuba as we can claim a colleague with such talent! Rich plays “Georgia” and “Don’t get Around Much Anymore” where he plays the low pedal tones, and then wails on notes only a trumpet player can dream of. As budding young musicians, we had only seen Rich as our conductor. He hadn’t played his horn much, other than to play a phrase or two for the brass sections. On the night of the show, Rich pulled out his 4-valve Yamaha, and proceeded to play an Intro to “Don’t Get Around Much Anymore” that made us all practically soil ourselves. Only at that point, did we realize we were in the presence of true greatness. Thanks for putting together this website. Rich had a profound influence on all of kids he worked with and in this case, one really lucky guitar player from Rock Island, IL. My name is Howard Hedges and I first encountered Rich at a Jazz Clinic in Florida in the early '70s when I was in high school. He made a lasting impression on me from that very first time. Of course his musicianship knocked me out immediately, but what was to follow throughout the day was to shape my approach to life, music, and my career for the rest of my days. "Always play to someone you love." Whenever a job or project started to take on the sheen of tedium, that quote snapped me right back to the business at hand. When you are doing something for someone you love, how can you do anything but your best? A couple of years later we met up again, this time at a Stan Kenton Orchestra in Residence Clinic. I was by this time a Bass Trombonist in the Kenton Orchestra in 1978. While I had educational responsibilities at the clinics, Rich held court into the wee hours of the morning. The Hangouts would begin with the exchange of jokes and "war stories" of the music business and end with the discussions of WHY music so consumed us. For the next few weeks of that Summer, dawn would be cracking as we broke camp for a couple of hours sleep before facing the students for the next twelve hours of that day. So many pieces of the puzzle that was Rich Matteson fell into place when we did the clinic at the University of Texas, Arlington. At this time Rich was still on the staff at the University of North Texas. We were close enough to his home that we got to meet his wonderful wife, Mikki. Over the years of hanging out with Rich I came to believe he was always passionate about music. But, his marriage to Mikki focused not only his passion for Music, but for Life. He always managed to place his Family first while not sacrificing an ounce of commitment and love to music and teaching. For anyone who has tried to establish that kind of balance, you know what a monumental undertaking that can be. Rich's philosophy of Life and Faith proved to be the bedrock of his courage as he faced the terminal phase of cancer. His passing crushed me, but it made me realize I had been charged by Rich to carry his approach to Life and Music on to other musicians; students, to weekend warriors, to professionals, and now to a radio audience here in Homer, Alaska. I cannot tell you how freeing it was to know that you could maintain a basic moral foundation and still be a professional musician! The lessons learned from Rich Matteson are in place within my past and present students and some of them do not even realize it! There are thousands of us out here whom Rich touched over his life. NO ONE who crossed his path could not have been affected by him. He did not force or preach his philosophy on you. Many times, something he said or played would smack me in the face days or weeks later! As long as there are players and educators of music in this world, Rich will always be among us! Many thanks go out to Rich's wife Mikki as she has continued to keep Rich's approach to Life and Music alive. Anyone stuck and spinning their wheels in Life and/or their Music need look no further than the "Philosophy" link on this Web Page for the appropriate kick in the pants. Long Live Rich Matteson! Bass Trombonist, Stan Kenton Orchestra 1978...and other stuff. It will seem strange to those of you who know me as pretty much a “square” to read a story from me concerning Rich Matteson. Perhaps that is the best indication of his influence in music, but I have a more exact instance in mind. Matteson performed at one of the evening concerts at the Tri-State Music Festival in Enid in ’70 or ’71 or ’72 with some big band—can’t really remember who it was, but I think it was an Air Forces Band from some Base in this part of the country. He was preceded by a jazz trumpeter whose name I also don’t remember. Even those of us at the concert who were from the many small rural Oklahoma Public School band programs had heard a jazz trumpeter before, so whoever he was, he didn’t make much of an impression on me or the crowd that night (now someone will write me and say it was Severinson or Maynard!) After the trumpet player, here comes a funny-looking guy who was going to play jazz on the baritone: that’s what we knew as the name of his instrument. My friends and I from Pond Creek High School were laughing up our sleeves before he started, but by the time he finished we were on our feet cheering. I believe Rich Matteson helped us to learn not to prejudge the quality of a performer or of music until I had heard it. I remember the first time Rich really dug something I played. This was in his improv class at UNF. It wasn't anything terribly hip, but it was just the right thing to make the changes. All of the sudden everthing was interrupted with a mighty "WOAH!!!!!......" followed by "YEAH BABE, THAT WAS BEAUTIFUL !!!" Then we kept playing, and a lot of things became much clearer to me from that point on. I still remember that lik too. Rich Matteson has been a major influence on my musical career. His help, friendship and guidance have been a major factor for my love of jazz. I first met Rich in the fall of 1969. After seeing an article in the Daily Oklahoman, I took students to Lawton for a jazz concert featuring an unknown, to me, jazz tuba player. This last minute decision to go to the concert, when I look back was one of monumental importance to my teaching career. Rich came to Weatherford later that fall for a rehearsal with my high school stage band. He returned in February 1970 for the first and only Weatherford Stage Band Contest. From that festival, the Southwestern Jazz Festival started in January 1971. Rich appeared at the Southwestern Festival in 1973, ’77, ’81, ’84, ’89 and ‘90. Rich was one of the first conductors of the Oklahoma All-State Jazz Ensemble and appeared at OMEA in 1984. He appeared several summers at the Clark Terry Jazz Camps at UCO and played concerts and festivals throughout the state. Rich has been a tremendous influence on many of the jazz educators and students in this state. Everyone involved in jazz education in Oklahoma owes Rich Matteson great debt of gratitude. As a young boy I could never get in to the music the other kids were listening to. Some voice inside of me said that's not the music for me. Perhaps it was the same voice that told me not to smoke when all my friends did. Never the less, even as a young boy, I had a desire for quality music. Well, one day that quality music arrived in the form of a cassette tape my dad had brought home. Most of it contained the trombone soloist Aurthur Pryor, and a couple tracks were from UNT. But there was a hidden surprise at the end of the tape. Two tracks by this hot Dixie land group. Since this tape was my introduction to jazz, I had no idea what I was listening to, but I liked it. Specifically what I can remember is the tuba solos on the Dixie land tracks. They blew me away. I don't know what it was but I loved those tuba solo's. It's like when a boy discovers he wants to be a doctor more than anything else in the world, I heard Rich Matteson and knew exactly how I wanted to play trombone. It wasn't until many years later, when I was studying jazz at The University of North Florida that I realized what I had as a kid. And boy that made me feel lucky. And thankful to my dad of course. Unfortunately, by the time I reached UNF Rich had passed away. All that was let was his wonderful music. But not to worry, Rich speaks every time I play my horn. My husband Kevin Sanders and I were music students at UNF and we were blessed to have known Rich in his final years. At that time, we had no idea what valuable knowledge would be used permanently in our profession. Rich's gentle spirit and exuberant passion for his music instructed us in ways that words can't possibly express. He was simply a gift to everyone who had the honor of knowing him. Thanks for the opportunity to pay tribute to our good friend and mentor, Rich! He was a very dear and sweet man who went out of his way to get close to his students. Thanks again for the opportunity to pay tribute to a man who meant much to me and was willing to give of himself to share the art form which he so dearly loved. I was a guitar student at North Texas State in the late 70s/early 80s. Rich sat on two of my improvisation juries. I was always intimidated by trying to improvise in front of Rich Matteson, Jack Petersen, and Dan Hearle (I believe the years those three taught at North Texas were the high water mark for the music school there). But Rich was always encouraging (all of them were). I used to love hearing Rich, Jack, and Dan play together - it was so inspirational to a young music student. Rich also sat in on my Guitar Master Class final exams. Jack Petersen would have have Rich call out keys in which we had to play our material and which tunes (since Rich wasn't a guitarist, he didn't know which keys and tunes were harder than others). I was always scared when I walked into the room - but I'd walk out feeling ten feet tall after getting a compliment and encouragement from Rich. He was a great guy. I heard Rich playing in Sweden in one of the first years of the 90´th. He had been playing with the Sandvik Big Band and on his way to Stockholm Airport he´d stopped in my town Gavle and played for us. He was so good and skillful playing with swing and tempo and technic on his large instruments. After that I have never förgot him and his way to play! I play jazz trumpet and he is on the top of my jazz favourites! It was in 1991 that I was determined to get Rich back to Dallas, for what I was told would be his last time in Texas. He was ravaged with cancer, but just like Rich he said he would be here to clinic and do a concert at the Mortan H Meyerson. Symphony Center with Roy Hragrove. This was for the Arts Magnet/Arts District Jazz Festival for Scholarships. Rich was, as always, in top form for his clinic, which was well attended by many students and friends in the Dallas. Fort Worth/Denton areas. By the evening he had become somewhat fatigued and was feeling the wrath of the disease, that by this time had taken over his body. Like the trooper he was, he came out on stage that evening and played to a SRO crowed that was in awe of his expertise and depth of musical ability. He and Roy Hragrove dazzled the audience for almost and hour and then it was time to go. This would be the last time I saw Rich and I would hold onto the memory of his commitment and excellence to jazz and jazz education for ever. Rich was one of the founding jazz education fathers who you just could not get enough of when in his presence. He would leave you with the lasting impression that you could, like him, do what you wanted to in this business of music. He had the ability of convincing students as well as pros that you could do it, and he did, in every lesson, clinic and performance, he did! You see, even when Rich was down, he would bring you up! This is the mark of a gifted, talented and very special person, who, by just being there could change the course of a life. Many of us who knew him miss his presence, but we all realize that his spirit lives on through all those many he touched. In several years at North Texas, I'd had no success in jazz lab bands, and resigned myself to classical teaching. Our music ed class for future school band directors was sub-taught one day by Rich Matteson. He showed us a simple pentatonic scale for beginner blues, then went around the room giving each of us a chorus. I played a simple determined chorus and Rich said "yeah!" Afterwards he told me "You would be a good candidate for teaching jazz." I was pumped. That was the first encouragement I'd received from a jazz teacher. Rich's enthusiasm and encouragement had an effect on students. I remember Rich telling a story with some relish in improv class one day about an ultimate put-down he'd experienced. He'd been playing in a dixieland band, maybe in Vegas; they were on break, walking down the street in their garish red-striped uniform jackets. They entered a Ferrari showroom and crowded around a vehicle, pointing and looking over the engine, discussing and admiring this sports car that cost much more than any of them could afford. Rich said the salesman came out of his upstairs office, walked across then down the stairs then over to the car, saying nothing to any of them. The salesman took out his handkerchief and wiped down the surfaces of the car where they might have touched it; he then carefully closed the hood of the car, wordlessly turned and walked back upstairs to his office, never acknowledging them. Rich had a sense of humor. First, let's talk about his sense of humor. You could count on him in a clutch or tense situation to level attitudes. If humor is a tool, Rich was a master mechanic. There's a lot more. Simple-complex, funny-serious, humble-arrogant. He was all of this and fluidly moved from one to the other, like going from gm7 to C7. His power was that he played that way, and people knew it. This is called communication, and maybe he did it better than anybody. He pretended that he didn't take himself seriously. Some folks believed him, but I didn't because I know what made his message so strong. …and, of course, he's very lovable! Rich was a mentor to me as well as being one of my closest friends. Playing together, touring and teaching in Sweden as well as The United States over twenty five years, along with our mutual great friend guitarist, Jack Peterson are such beautiful memories rich with great music and humor. The three of us, lead by Rich, ran Outrageous Mother publishing company for fourteen years. Many of today's great jazz band composers such as Rob McConnell, Mark Taylor, and Matt Harris had their first charts published by the company. We recorded four albums together. Perhaps most notably was "The Sound of The Wasp" which is still circulating to this day. The number of musicians touched by Rich Matteson over the years is incalculable. His musicianship, spirit, and, great humor lives to this day with all those who came into contact with him. Rich Matteson was a consummate jazz musician/educator made up to equal parts of love for his students, love for the music, and an unfaltering spirit to see that the ultimate in teaching is accomplished. Rich had the golden gift of being able to build a jazz studies program from scratch (University of North Florida) and the results are spectacular. The program is proof that dreams do come true to those deserving few. Rich was one of the warmest people on the earth, and I am proud to claim him both as a friend and mentor. Rich Matteson was my musical mentor, my musical collaborator, my musical inspiration, and MY FRIEND! Teaching with him at the National Stage Band Camps, I never ceased to be amazed by is energy, enthusiasm and love for the students we worked with, as well as his rapport with all the musicians on the staff. Every time I got to perform with him or listen to him in concert, the same feeling would come to me: "You can't do that on a brass instrument!" His command of the instrument was unparalleled, but even more important was his impeccable musicianship. He truly embodied the phrase "Musician's Musician." Rich was a great euphonium player and a great guy!! He inspired me to play jazz on the euphonium. Hearing Rich Matteson play jazz on euphonium made me realize that jazz is a universal language and could be played on all instruments, not just a select few. Rich was at North Texas (when I was) in school. His studio was across the hall from a studio I shared with another TA in ’75-77. I can still smell the scent of Valley View Mist, a pipe tobacco Rich used at the time, what a sweet smell. It was also a happy smell because whenever you smelled it you knew that Rich was close by. Rich was always in the best of moods, rarely did we ever see him frustrated or distraught. He treated his peers and students with the up most respect, kindness and most of all encouragement. Rich Matteson was always encouraging, playful and kind. The last time I saw Rich, it was the opening of my music store in Albuquerque in August of 1986. The spring prior to coming to Oklahoma 1992 was the last I spoke to Rich and Mikki. Again always thinking of others, he encouraged me in my new position. I will always remember Rich Matteson, and what he meant to me and a countless number of young musicians throughout the years. I have and will try to pattern myself after his many attributes. Entries from friends will be collected and placed here. More entries from friends will be collected and placed here. Please help us fill up this page with memories. If you would like to email an entry for this page, please contact WEBMASTER.